Contains HTML and PHP code. Getting facebook_access_token and facebook_id values from users table where uid=$user_session_id. I have a query.. In this code which variable should contain the status string. 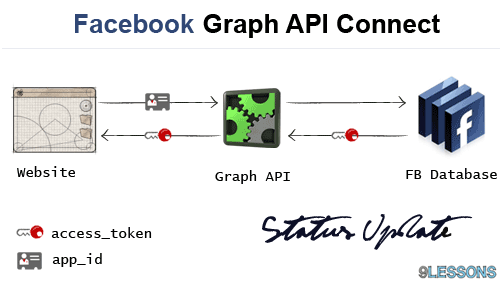 Facebook Official PHP SDK you mentioned also uses cURL to interact with their API. There is a small syntax glitch in the code you provided for update.php at around line 12.
thank you brilliant exactly what i was looking for!!! hi tamada! demo please ? Which variable contains the text - via "9lessons lab" ? Could u give the script plzz... ? another thing, how can you impersonate the Page instead of using your current user ???? the user or someone who is looking for comment can simply find it by choosing the time and date and so on. or name or places or any code:P hope you understand my english. thnx. Ok so im a dummy, the users table? im guessing it contains the facebook id of the user right? is that something i have to get off the user? how does this work? such great it's really help me! Very nice and efficient blog..
i get the post id, but i don't see the post on my wall .. where is the problem ? sorry for the confusing messages of the image. thanks in advance! nice post! but can u tell us how to post on the wall using API? Thank's a lot for this tutorial! When i am trying to use the code i am getting the following error "Malformed access token"
Code no longer posts to facebook i think you need permission to the app which this code does not make the app do. Where can I find db.php? That's amazing web blog and thanks for sharing..